I think that I like this photo alot. 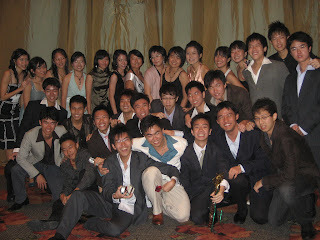 Thank you rafflescanoing 06/07 for the wonderful memories. Flying off tomorrow and coming back on the 29th. that means ill miss christmas in singapore. first time ever in 18 years of my life. I always wanted a christmas tree at home. That had been my little childhood dream. I'll imagine having a huge green fir tree and decorating it with bells, toys and a fairy on top. Probably the result of too much Enid Blyton. Merry christmas to one and all. In this festive season, let's forgive, forget, be kind to everyone and have a blessed christmas. Hope when the new year comes the 12 of us can meet up again, cause I really miss you all so and I can't wait to hear stories of your holidays. 2007 is almost nearing its end. 2 years in rjc has flown past. i had been foolish once but i've since come to terms with the people. now all that's left is for me to come to terms with myself. perhaps the hardest to do. competitive canoeing, i think for me has come to a close. I won't say definitely because who knows what the future may bring but for now, i'm willing to let it go. Whatever that happened at nats was not a good representation of the effort we've put in. but i've come to terms with that. its not that i've given up believing in hard work or that i'm running away from it, but more that i've found what i was looking for.